Glycemic index (GI) is a rating system for evaluating how different foods affect blood sugar levels. This system has been used to select foods and create diets that aim to control obesity, manage diabetes, etc. This software has the GI ratings (low, medium and high) for over 500 most common foods. Users can assign and modify the ratings for any foods in the NutriGenie database or in their own database. With a single command, the user can see all foods in the appropriate GI category for selection. 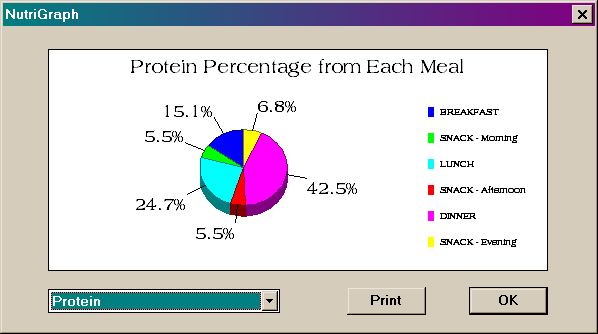 Besides evaluating individual foods based on their GI, the software also provides a unique food guide pyramid analysis of user's diet to make sure that it is nutritious and balanced. In addition, millions of well-balanced daily menus can be automatically generated by the software based on user's calorie specification. Some NutriGenie features that few other nutrition software can provide: Foods can be sorted by specific nutrient content for better choices. Users can switch between graphic evaluation of their diet based on U.S. RDA or their own preferences. They can create personal food groups as well as hide uncommon foods making food database management very convenient. Our graphic analysis of calorie and individual nutrient distribution throughout the day is essential to those who need to carefully regulate their food consumption. Various nutrition and healthy weight guidelines from the U.S. Surgeon General and government health organizations are also presented so that users can make informed decision about their diet.